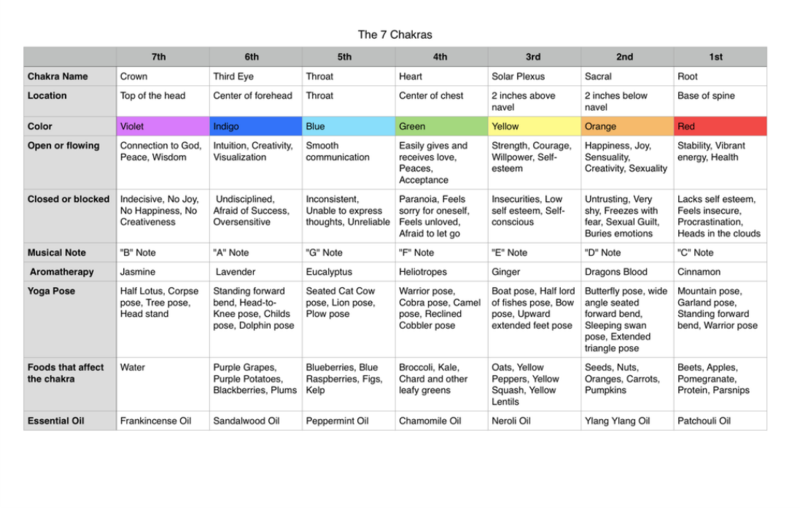 Seven chakras are located throughout your torso, from the bottom of your spine to the top of your head. When your chakras are full of light and unblocked, you can do anything and achieve anything you want. Located at the top of your head, the Crown Chakra connects you to God. When it’s blocked, you aren’t you, you don't like anything about you, and you’re cloudy-headed. But when it’s open you feel beautiful, inside and out. You feel pure bliss, and the information, understanding, and acceptance you need to thrive comes readily to you. Located on your forehead between your eyes, the 3rd Eye Chakra allows you to see spiritually. Some people call it the chakra of question, perception and knowing. When this chakra is blocked it can result in lack of foresight, unyielding mental rigidity, and selective memory issues that can cause relationship friction. Located within your throat, the Throat Chakra is all about communication, self-expression, creativity and judgment. A blockage in your throat chakra can result in lack of, or faulty, communication, including dishonesty and creative blocks. Located on the center of your chest, the Heart Chakra is known as the center of love, or the house of the soul. This is the chakra that allows you to fall in love. Unconditional love energy flows from the heart chakra all the way to the Sacral (sexual) Chakra. The Heart Chakra is where powerful feelings of attraction are released. A blockage in the Heart Chakra can result in lung and heart issues, chest pains or immune system problems. Located a few inches above your navel (belly button), the Solar Plexus Chakra is the seat of your emotional life. It is this Chakra that releases your sense of self-esteem, self-worth, and the power to be confident and in control of your life. A block in the Solar Plexus Chakra may bring about a sense of victimization, anger, frustration, and lack of direction. Located about two inches below your navel, the Sacral Chakra is your sexual chakra. When it’s open, you have a sense of abundance, pleasure, sexuality and well being. When it’s blocked, you may experience obsessive behavior, sexual guilt or issues and emotional problems. Located at the base of the spine, the Root Chakra represents physical survival for your foundation and the feeling of being grounded. If this chakra is blocked, you may experience procrastination, fear, paranoia and the urge to be defensive and/or aggressive. Place one of your hands on top of your head. What do you feel? Is your head warm or cold? If it feels warm, it is open and flowing. If it’s cold, it is closed and blocked. Move your hand to the center of your forehead and place it there. What do you feel? It is open and flowing (warm), or closed and blocked (cold)? Now move your hand to your throat and answer the same question: is your throat open and flowing, or closed and blocked? Check the final four chakras as you move your hand down to your chest, then your stomach (about two inches above your navel). Next, move two inches below your navel and then to the base of your spine. If any of those areas are cold, project light into it by placing your hand on it and envisioning light coming from the center of your palm into the chakra. You can envision white or gold light, or you project the color light associated to the chakra you’re working with.